← Why Was Adam Created? 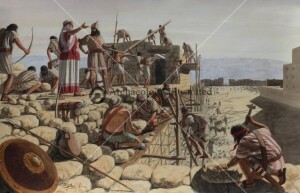 Nehemiah, having been put in charge of Jerusalem, had been commanded by God to rebuild its wall. To Nehemiah and his people, the protection afforded by Jerusalem’s wall demonstrated God’s blessing upon His people. 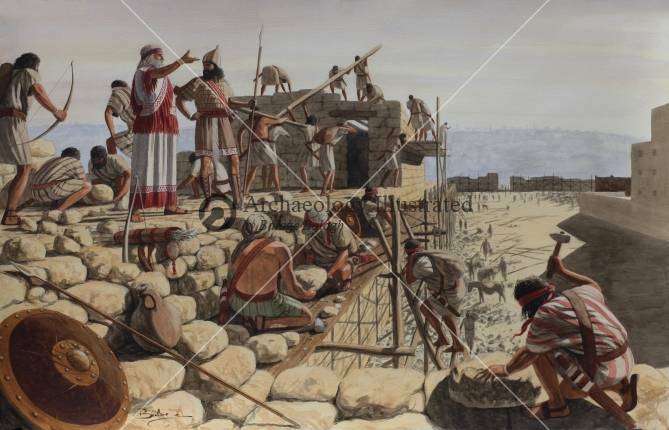 According to the narrative, God had led Nehemiah to work on the wall, no less than he had led Ezra to work on the temple. We learn from this that both the sacred and the secular were necessary to fulfill God’s plan to restore the nation of Israel. If the walls were unfinished, the temple would have never been finished. Both were necessary. The reason for this is easy to understand. In biblical times, and throughout the Ancient Near East, no city was safe from bandits, gangs and wild animals, much less invading nations. The more economically and culturally developed was a city, the greater the wealth of that city, and the greater the need for a wall. The temple, with its gold and bejeweled trappings, would have been particularly at risk. Practically speaking, no wall meant no city. The wall was an existential necessity for the Temple. No wall, no temple. Keep in mind that the Temple was the instantiation of God’s residence and the symbol of His rule and His values. The wall, therefore, protected more than the physical safety of the Jerusalem residents. The wall protected the values of God and the Israeli culture charged with seeding those values throughout the world. “The stranger who resides with you shall be to you as the citizen among you; you shall love the alien as yourself, for you were aliens in the land of Egypt: I am the LORD your God“. Weren’t ‘strangers’ a threat? Wasn’t the purpose of the wall precisely to keep strangers away? No! Where the wall was necessary for the Temple’s protection, the wall was not intended to prevent immigration of aliens into the city. Rather, the wall was a means, perhaps the principle means, of ensuring that immigrants into Jerusalem agreed not to undermine the values and norms of the Israelites. In other words, this command seems to have been issued to ensure that those aliens who were allowed to reside within the city behaved as its citizens – in return for which, the resident aliens would be treated as a protected class. By requiring that immigrating aliens abide by Israeli law and her customs, Israeli values were not only protected, but nurtured. Sadly, this idea is not widely understood by many contemporary Christians and Jews who would advocate for open borders. The biblical basis of their argument stems from a common misunderstanding of what the biblical authors meant by ‘stranger’ 1)Also translated sometimes translated as “foreigner“ or, in Hebrew, גֵּר (ger). The root of ger means to live and flourish among people who are not blood relatives. This meant that the ger lived as a protected alien. Israelis (and other tribes) understood this. For example, because of famines the people of Israel were often protected while they journeyed through (or resided in) foreign land2)Abraham in Egypt (Gen 12:10); Israel in Egypt (Gen 47:4); Isaac with Abimelech of Gerar (Gen 26:3).. In return, God required that aliens who were traveling into or through Israelite territory were to be treated as the Israelites had been treated while the resided (and flourished) in Egypt. This ethic had its corresponding obligations: the foreigners who lived with the Israelites or within Israelite communities were to be required to live as their hosts lived, including participating in the Israelite ceremonies, rituals, and celebrations. In other words, to remain within the community and be treated as a native, the alien must adopt and live by Israeli values. To this end, only those aliens who were willing to live by Israeli norms were permitted to live within the Israeli communities (Exodus 12:49, Leviticus 24:16, 22). This story has much to teach us about why God requires a quid pro quo between a nation and the foreigners who desire to live within her. For example, the wall acts as a filter of sorts. Only those people willing to abide by Israeli customs are permitted to reside within its bounds. In the absence of its wall, the city (and its Temple) are at risk not only of physical destruction but the gradual erosion of the values established by God for the nascent Israeli nation. 2. ↑ Abraham in Egypt (Gen 12:10); Israel in Egypt (Gen 47:4); Isaac with Abimelech of Gerar (Gen 26:3). This entry was posted in Uncategorized and tagged Immigration, Jerusalem, Nehemiah, Stranger. Bookmark the permalink. *I am studying Nehemiah right now in my Old Tesatment religion class through BYU-I. I wanted further study on Nehemiah and found this post. I appreciate your insights and feel that you are correct in your conclusions regarding the border. I feel that the leaders of America must accept God in their lives in order to gain the wisdom and common sense needed to protect America’s borders. I wish they would study the scriptures for direction in running our country. I love making connections between ancient Israel and modern day. The scriptures are true!